Again they had a pre-dawn breakfast and despite having to wait for half an hour for Donna Prominencia left Quimica early. With a jaundiced eye Morgana noticed that as well as an overloaded pack horse, Prominencia had also a donkey with two large baskets of extra clothes! Felinora on the other hand had a small sack of her belongings plus another with the leg of a cow in it. These she added to one of Morgana’s mules. Scary the lion made the horses nervous whilst on the other hand he gave the unicorns a wide berth. Morgana suggested that Felinora try to get the horses used to the lion being with them. It would be no good if it frightened her mounts as much as the enemies. Likewise she shimmered her gown near Prominencia’s beasts a couple of times to get them accustomed to the glow. Shimmering gowns were not seen much in Azelad it seemed. “So Stetia used to have kings?” asked Sir Jean Lotine. They camped for the evening near a small forest. Near enough to obtain firewood to cook their dinners on! Morgana ordered them to collect enough for another days supply. Just after dark of Woeday 3rd of the Twelfth Moon three riders came up from the south. “It would be wise if we could overwhelm one force or the other before they can assist one another.” suggested Sir Jean Lotine. “Yes, I would that we knew which force was which.” said Dame Anise. “It would help Maudette’s cause if we could destroy Sir Lambert’s menie.” “But these knights of Rudolphus may provide the more durable opponents. They might attract recruits from all of Thentis and Perigord!” objected Sir Jean. “And perhaps even from Fara! There are yet Eruvians there sore at Maudette.” added Sir Dino Rinocero. Morgana decided to take the bulk of her force along the track to the west of the ford. She ordered Sir Dino Rinocero to peel off to support the Dimini defending it. Sacrada Felinora was to take her lion out ahead to the right of the main force. As the darkness lightened they could see a single rank of white clad knights standing on the crest of the hill ahead. A horn rang out from them followed by an answering call from beyond the slough. 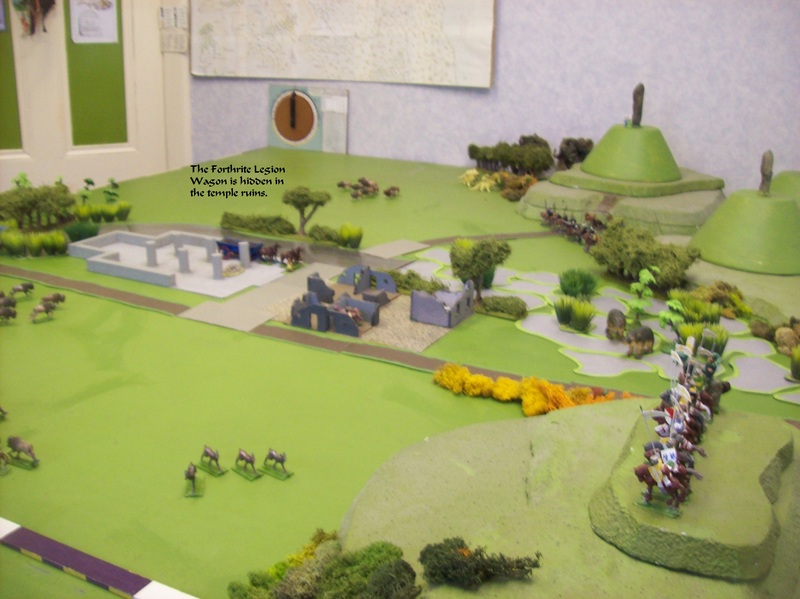 Once further forward they could see Sir Terence’s menie at the foot of the Tumuli topped hill to the left of the ford. On top of the tumuli were two foot figures clad in sky blue and lime green. Morgana deployed her troops into battle array as the white clad knights who must be the Order of Rudolphus advanced cautiously down the hill. At the ruins the Dimini rushed their wagon out to block the ford. There seemed to be quite a lot of them! 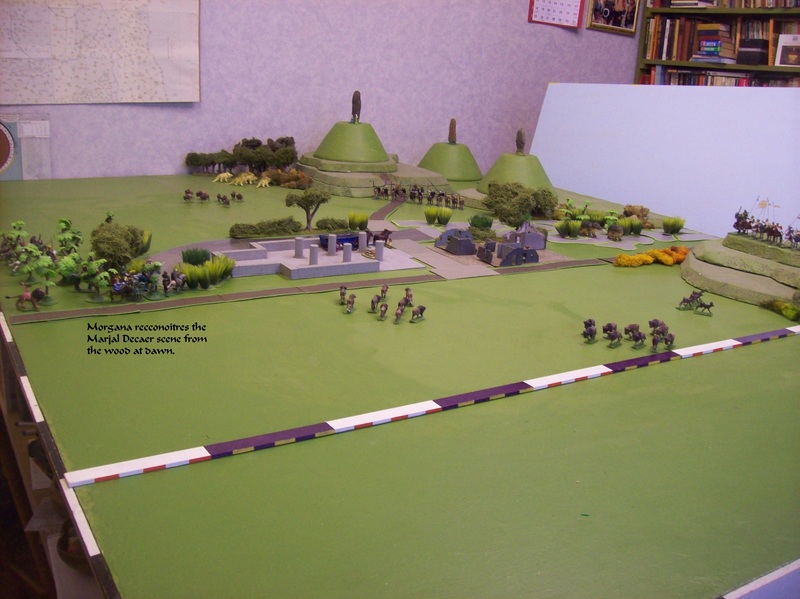 Sir Terence’s menie moved towards the ford whilst the two foot figures ran helter-skelter down the tumuli to their mounts at the bottom. With her main force ready to advance Morgana shouted “Shimmer! ‘Evoca Gapode Igual!’” The cherub duly appeared above her head and began to play his inspiring trumpet recital but her gown remained dull. “Forward! Shimmer!” shouted Morgana and Dame Anise next to her commanded “Deer!” to the unicorn Hilda. Her gown still remained dull! Of course she had been wearing it daily for almost a year and a replacement was being made up for her back in Charles. Their opponents had halted and were dressing their line. On the left Sir Terence’s menie was almost upon the far side of the ford. On the right Felinora on her lion were wheeling out to threaten the outnumbered enemy’s flank. “Shimmer! Charge!” shrieked Morgana and both her menie and the Order charged. At least they started to but the lion Scary roared causing two of the Order to stampede back up the hill and two more to halt. Morgana found herself heading straight for a giant green knight mounted on a giant caparisoned horse. Fortunately the horse jibbed to a halt, frightened by her Shimmering gown. Sir Louis Cocodil and Sir Fier Feuille attacked him from the left so she and Dame Anise paused to assess the situation. Mistress Hedkah was leading the damsels and baggage animals into the ruins. 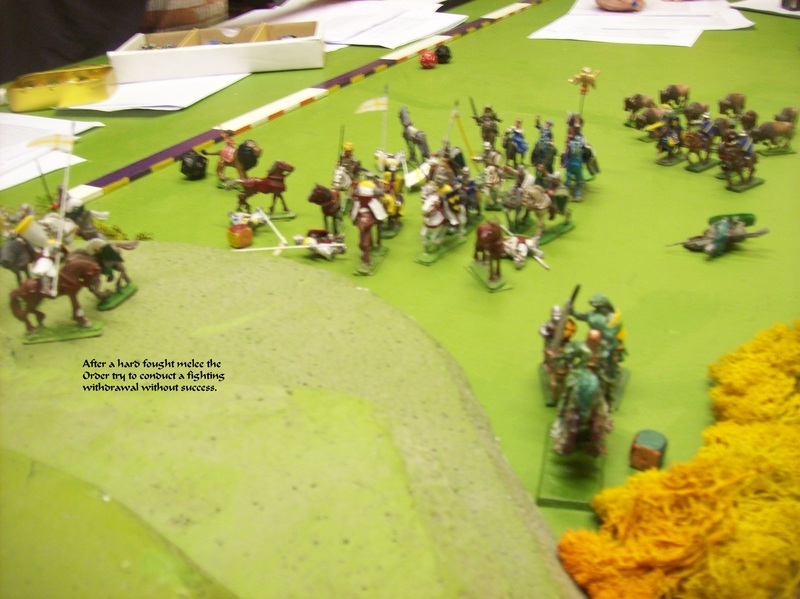 At the ford Sir Dino’s squad had backed up the Dimini and as a consequence Sir Terence’s force had swerved away from the ford and along the far side of the slough. “They must mean to come through the wood to take us in the rear!” exclaimed Dame Anise. “Not if we can finish with this Order in time!” answered Morgana looking at the melee to her right. There although Sir Gilbert had received a lance thrust their superior numbers were beginning to tell. The enemy hornblower charged Scary the lion who was swiftly supported by a squire who brought him down. Unfortunately Sergeant Fillip’s horse of the Doughty Squires found proximity to the lion too much and carried him away towards the slough. Squire Bertram broke his sword in the fight. But then “Retire!” shouted one of their opponents and what he had hoped would be an orderly retreat turned into a rout. 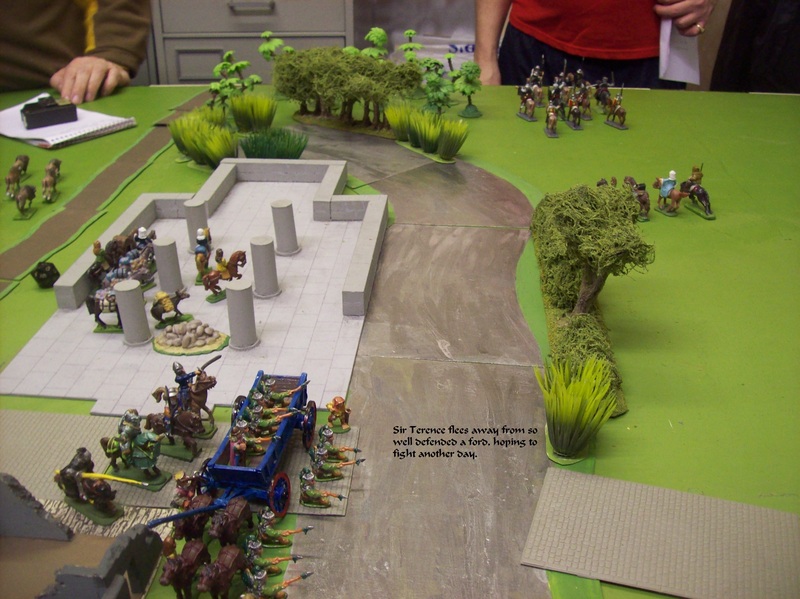 Sir Louis and Sir Fier chased down the giant knight and slew him beside some bushes. “We surrender!” called out the enemy commander. One of the stampeded knights had halted in time to be engaged by two Doughty squires but the other disappeared over the hill and away. Only three of the Order remained mounted to throw down their weapons. “I think my job here is done?” called down the Cherub Igual. “Prithee fetch the damsels here for us noble cherub. They have the bandages and wound dressings that we now need!” answered Dame Anise who was stanching Sir Gilbert’s wound. Morgana looked back towards the wood from whence they had come. Soon Sir Terence’s force emerged from it but headed off to the west. Having seen the demise of the Order of Rudolphus he had realised he was hopelessly outnumbered. The cherub brought up the damsels with the First aid satchels and then vanished. Unfortunately by the time the aid had arrived the sergeant who had born the Order’s banner (Argent a cross Or) had bled to death. Their hornblower was in a coma from blows to his head and a knight Sir Simon St. Angiels had a deep chest wound. There followed some disputes as to whom should obtain the ransom money for the captured knights. Morgana asked the knights themselves for their opinions to settle them. Sir Simon Angiels was not sure who had wounded him so she decided that his ransom should be sent to Grand Duchess Maudette. The captured knights were their Preceptor Sir Denis de Brecy, taken by Sir Jean, Sir Philip Martigues taken by Toxo and Sergeant Zabadan and Sir Yves Montbeliard taken by squires Luis and Pedro. The dead were the banner sergeant, Sir Geofroi Grasset, Sir Renier Penthievre and the giant Sir Geraint. 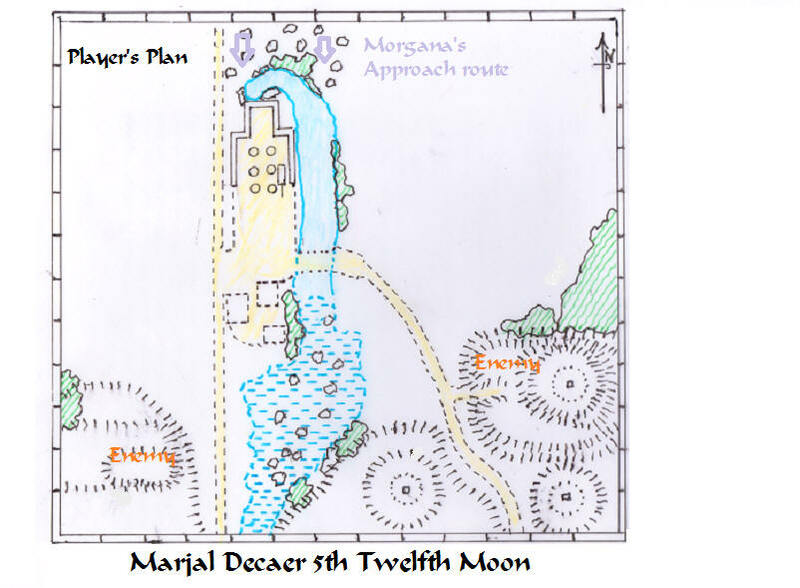 It was still early morning but Morgana decided that they would camp at the ruins for the rest of the day and night. There were the wounded to tend, the dead to bury and several matters to decide. Apart from the weapons and armour, they had captured eight destriers and the giant knight’s great horse. With the border but four myles away the Doughty Squires their task accomplished must leave them. So indeed must Sacrada Felinora and her lion whose assistance had made her victory so much easier. Then she must find out what the Dimini wanted from her? So they laid out their camp using the ruins to make it most difficult to attack should Sir Terence try anything in the night. Morgana decreed that Sir Louis should keep the giant knight’s shield and Sir Fier his helmet. Her menie should take two swords and two spare destriers as spares plus an axe for Toxo who had captured it. She appropriated the Order’s banner with a lance pennon for each of her squad leaders, Escudero Roland and Sacrada Felinora to whom she gave the giant’s sword. It would be a fine trophy but was too big to be practical for anyone of less than giant stature. She also gave her one of the destriers to help carry it and her baggage. The rest of the booty was given to the Doughty Squires to share out as they thought best. On the Order had been 136 Gilden Pezzi worth in coins. So she gave 36 between the captives and the remaining 100 was to go to The Godwin Forthrite Legion. 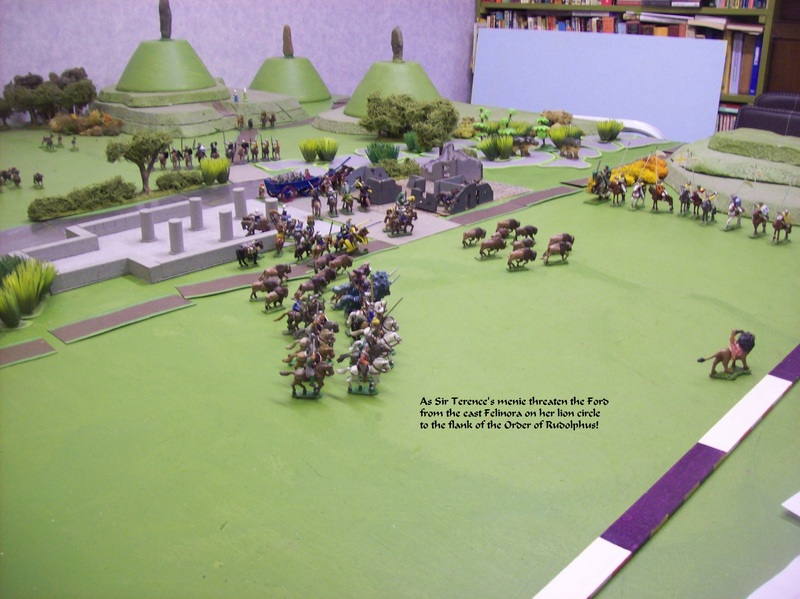 Though they had not had to fight, their presence blocking the ford had kept Sir Terence’s menie out of the action altogether. The knight’s jewellery she allowed them to keep with those of the fallen ones to go back to their families. Apparently unlike other Eruvian orders the newly formed Order of Rudolphus allowed its members to be married! Escudero Roland agreed to take the prisoners to be held at his home in Corvo until their ransoms were paid. These would be at the standard rates of 2,000 Gilden Pezzi for a knight and 4,000 for the Preceptor. These matters arranged she asked to meet the leaders of the Godwin Forthright Legion with Sir Jean Lotine and Dame Anise Galette. They turned out to be Wandril a Dimini Peddler, Primrose Oxdriver, and the Stetian human wagon owner Hermanez. Morgana’s brain reeled at the enormity of this objective. “There is peace also between Thentis and Narchad” commented Sir Jean. “What do you know of Durgan Miss Daffodil?” asked Dame Anise. “I have not been hired to go there!” declared Hermanez. “But what can we do now if that objective is to be abandoned?” asked Wandril. “But would your wagoner wish to risk his life and equipage likewise?” asked Dame Anise, thinking that having the dimini with them would be more of a trial than an asset. “I am sure that we can come to an adequate settlement with Senor Hermanez!” said Daffodil and so it proved.